Drew Manning, a natural fitness junkie and devoted personal trainer, had never been overweight in his life. He never craved junk food or missed an opportunity to work out. Yet despite his obsession with fitness, he failed to help his clients reach their goals. Something had to give. Manning needed to understand what it was like to be on the other side—spend a few months in his clients' shoes or, rather, size. For six months, Manning radically let himself go. He stopped exercising and ate nothing but the typical American diet of fast and processed foods. Not surprisingly, he started to gain weight. Manning made national news when he posted a blog revealing that he had gained more than 60 pounds (he ended up gaining 75). In only half a year, the out-of-shape trainer-turned-blogger had gained more than he ever expected—and not just in pounds. Manning devoted the next six months to losing the weight as quickly as he had gained it. The lessons he learned were priceless, as he had now experienced both sides of the weight-loss battle. What started as a physical challenge became an emotional and mental wake-up call. 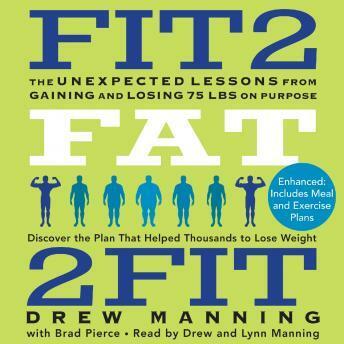 In Fit2Fat2Fit, Manning reveals the practical takeaways and profound in- sights of his yearlong journey. With startlingly honest stories, concrete easy-to-implement strategies, recipes, exercises, workout routines, meal plans, and much more, the reader is fully equipped to achieve any weight-loss goal.